Size: Adult--1 1/2", larva--1 1/2"
Identification: Cutworms are the immature stages or larvae of drab gray or brownish moths that are active at night. They curl up while at rest or when disturbed. Newly hatched cutworms are brown to black. Feed on seedlings of tomatoes, peppers, eggplant, cabbage, and other food crops, cutting the plant off at ground level. Biology and life cycle: Adult moths lay eggs in early summer. Larvae hatch within two days to two weeks and feed on grass and other plants for three to five weeks, then form pupae in the soil. Adults emerge at various times during the summer. One to five generations a year. 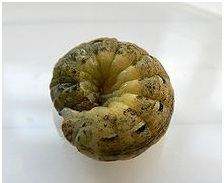 Overwinter as pupae or young larvae. Habitat: Soil dwellers that chew off tender shoots as they emerge. Grassy and weedy fields are attractive to moths for egg laying. Spring-planted ornamentals and food crops. Feeding habits: Cut off young seedlings at ground level. Some will climb up plants and chew foliage as army worms do. Economic importance: Several species of cutworms can damage small grains, tomatoes, peppers, eggplant, and cabbage. Natural control: Trichogramma wasps, birds, frogs, fire ants, and beneficial nematodes. Plant big healthy transplants. Organic control: Cutworm collars around plants. Diatomaceous earth or fireplace ashes around plants. Bt (Bacillus thuringiensis) products mixed with moist bran and molasses around plants. Release beneficial nematodes. During daylight hours scratch the soil around damaged or cut-off plants and heavily water the soil. The cutworms will float out being easy to catch and destroy. Crushed red pepper and cedar flakes will also help. Insight: Malcolm noticed that cutworms destroyed around 10 percent of the vegetable transplants annually until the imported fire ant moved in. Cutworms can be spotted easily at night with a flashlight because they reflect the light. Plant collars made from slit soda straws expand as the stem grows and gives excellent protection.